Russia's move into part of Ukraine has caused genuine unease in neighbouring countries like Poland and the three Baltic states and a sense that they also are under threat. Poland's leaders have played down the danger, repeatedly reassuring the public. 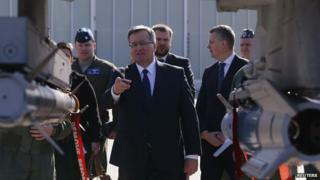 During an event to celebrate the 15th anniversary of Poland joining Nato on Monday, Prime Minister Donald Tusk said he saw no direct threat to his country, a view echoed by Poland's President Bronislaw Komorowski. But there is a widespread sense of insecurity in Poland. In an opinion poll last week, 59% of respondents believed Russia's foreign policy presented a threat to Poland's security. "I feel threatened by Russia because we're next. Ukraine is first, then the Baltic countries and then (Russia's President) Putin will make something bad here," Michal, a 30 year-old librarian told me. "Now they want to attack Ukraine but we are neighbours so I don't think Poland is safe, especially because we have a shared history with Russia and they were always aggressors," Dominika Ziolka, a horse-riding instructor said. This is not to say most Poles fear Russia is about to launch a military attack on them soon. But their shared history has generated widespread mistrust of Russia among Poles. In the 18th Century Catherine the Great annexed eastern Poland. The country did not regain its independence until the end of World War One. After just two decades of freedom the Soviet Union invaded eastern Poland two weeks after Nazi Germany marched into western Poland in 1939. The Red Army liberated Poland from the Nazis in 1945 and Joseph Stalin installed a Soviet-backed communist system in the country. The last Soviet troops left Poland in 1993. "I think there is a sense that certain boundaries have been crossed, that precedents have been created and because of that it's not clear where Putin is going to stop," Marcin Zaborowski, director of the Polish Institute of International Affairs told the BBC. "This clearly unprovoked aggression against another state is in breach of international law. It doesn't seem wise to hang on to the belief Putin's not going to go further," he added. Poland's insecurity over Russia is shared by the Baltic countries, which were incorporated into the Soviet Union after World War Two. Lithuanian President Dalia Grybauskaite warned last week that Russia was trying to redraw the post-war map of Europe. Ukraine was first, she said. Moldova, the Baltics and Poland would be next. Estonia and Latvia also have large Russian minorities, which is of concern considering Vladimir Putin's justification for occupying Crimea has been to protect ethnic Russians there. While some have seen parallels with Hitler's justification for his annexation of Austria and the Sudetenland in Czechoslovakia in 1938, Poland's foreign minister Radoslaw Sikorski has warned against such comparisons. "The people of Poland and the peoples of the Soviet Union paid a horrible price in the 20th Century, for a war that started on the pretext of protecting national minorities. I hope we have all learned lessons from how dangerous it is. But historical parallels are always dangerous," he said during a visit to London on Monday. The US has announced it is beefing up its military cooperation with Poland and the Baltic states. It is sending six more F-15 fighters and a KC-135 refuelling tanker to increase its support for Nato's patrolling of Baltic airspace. About 300 US air force personnel and 12 US F-16 fighters are to be deployed in Poland for a joint training exercise, a significant boost to the 10 US airmen who are already stationed in the country. The response is not just focusing on the military. "Our prime minister and president have said we have to work more intensely towards energy independence. Energy is vital because the threat is not just of a military nature, it's also about turning the gas taps off," Mr Zaborowski said. Countries like Poland have already experienced a switch-off. Much of Russia's gas supplies to Europe transits Ukraine on its way west. In 2009 a price dispute between Ukraine and Russia halted supplies to many European countries. The Baltic countries and Poland remain dependent on Russian gas. Last year Poland imported 60% of the gas consumed by industry and households from Russian gas company Gazprom. After years of saying it should and not doing much about it, Poland is now diversifying its gas sources. It will complete construction of a liquefied natural gas terminal to import gas from Qatar by the end of the year. It has also increased the capacity of interconnector pipelines with Germany and the Czech Republic to boost supplies from those markets. And it hopes to start producing its own shale gas in the future. Central and Eastern Europe's dependence on Russian gas gives Mr Putin too much leverage, Mr Tusk said Monday. He said he would speak to German Chancellor Angela Merkel in Warsaw on Wednesday about the political threats arising from this dependence. "Germany's reliance on Russian gas can effectively limit European sovereignty, I have no doubt," he said.